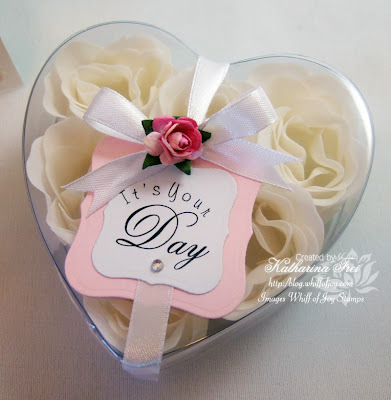 I found this clear, heart shaped box filled with roses of soap leaves and was sure that this would be a lovely small present for a special friend :) So I decorated it and created a matching card. Ich habe dieses durchsichtige, herzförmige Dose, gefüllt mit Rosen aus Seifenblättern entdeckt und wußte sofort, das sie ein tolles kleines Mitbringsel abgeben würde ;) Also habe ich die Dose dekoriert und eine passende Karte dazu gemacht. I am sorry for the bad pictures, but the light over here is so bad today, that not even my daylight lamp could help. I used the Party Sentiments collection from Whiff of Joy Stamps and cut them out with Spellbinder's Label 1 Nestabilities. Tut mir leid wegen den schlechten Fotos, aber das Licht ist heute so düster bei uns, dass nicht einmal meine Tageslichtlampe helfen konnt. Ich habe die Party Textkollektion von Whiff of Joy Stamps verwendet und mit den Label 1 Nestabilities von Spellbinder ausgestanzt. 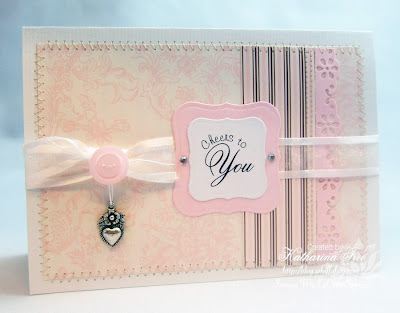 The border punch is from Martha Steward, the charm is from Embellishments.de, design paper and button from Stampin' Up. I love the new In-colour "pink pirouette". Der border punch ist von Martha Steward, der Herz Charm wieder von Embellishments.de, Motivpapier und Knopf von Stampin' Up. Ich liebe diese neue In-Farbe "pink pirouette". Paper: SU cardstock "pink pirouette", dp "Parisian Summer"
these are really pretty - love the soft colours you used. Great gift idea! Very Pretty! Gorgeous little set,love the card with the pastel colours and the box looks lovely. These are gorgeous projects Katharina! What a lovely gift! Beautiful, subtle creation, so pretty! Boah Katharina ist das schöööööööön.Dein Set sieht so sanft und zart aus,ganz toll.Gefällt mir sehr sehr gut. Love the colours it's beautiful. great gift and wonderful card ! fantastic gift, it is so beautiful, such a great idea to make a matching card too! That is a lovely set of gift and matching card Katharina. Das ist so ein süßes Set. Ik bied je een award aan deze kan je van mijn blog halen, weet helaas niet hoe ik hem je toe kan sturen . wow, das ist so ein edles, traumhaft schönes Set!!! Schlichte Eleganz... ein super Geschenk. Wonderful gift idea & a very beautiful card. Kirsten. So pretty great idea for that lovely box. Katharina this is amazing and what a great gift! That card is so adorable as well! Wow wow wow! Das sieht einfach nur zauberhaft und wunderschön aus! Genau mein Ding! These are just beutiful and both very elegent!! That is so beautiful! What a lovely gift! this is a absolutely lovely present!! Very classy, love the sewing.